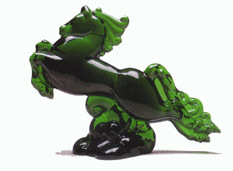 The fine quality of Heisey glass, made in Newark, Ohio, from 1896 to 1958, prompted many decorating companies to buy Heisey blanks on which to apply their own decorations. Heisey made both clear crystal and some of the finest colors available for Bonita Art, Central Glass, Lotus Glass, Oriental Glass, Rainbow Glass, Wheeling Decorating and many others. Cut and etched patterns were applied to Heisey glass by Eagle Cut Glass, Hawkes, Monogram, Pairpoint, Sinclair, and Susquehanna. 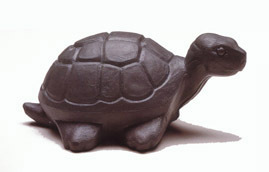 Even silver overlay and applied metal ormolu were added to Heisey pieces by Apollo, National Silver, Poole, Reed and Barton, and Tuttle silver companies. This new and carefully constructed book fully explores Heisey's 16 beautiful regular production colors, from Alexandrite to Zircon, along with several experimental colors, in 541 clear color photographs. Each color is defined with its production dates and illustrated with a broad sampling of pieces in many shapes and patterns. The picture captions include the color, pattern name, pattern number, measurements, and value of each piece shown. 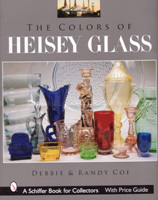 Both advanced and beginning collectors will find this book a necessary and convenient reference to stimulate their enjoyment of beautiful Heisey glass.